To start things off, I just wanted to wish you all a fun and festive St. Patrick's Day! I hope your holiday was filled with the luck o' the Irish. Today's post is a relatively new item sold now exclusively at the Disney Store...here we have the Disney·Pixar Let Your Dreams Soar coloring book featuring over 1,000 stickers! 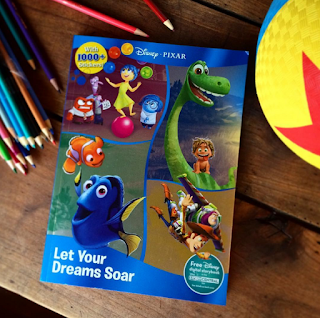 This is a pretty thick paperback book (64 pages) which spotlights several Pixar films with stickers and fun coloring pages including: Inside Out, The Good Dinosaur, Cars (with some Cars 2 thrown in), Finding Nemo, Monsters Inc. and the Toy Story trilogy. 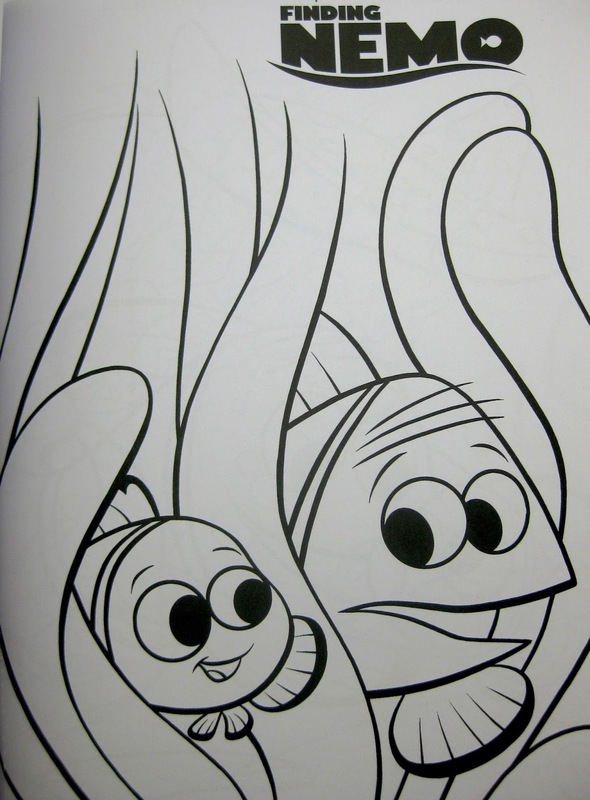 The back section of the book switches back to coloring pages; this time featuring Finding Nemo, Monsters Inc. and Toy Story 3. 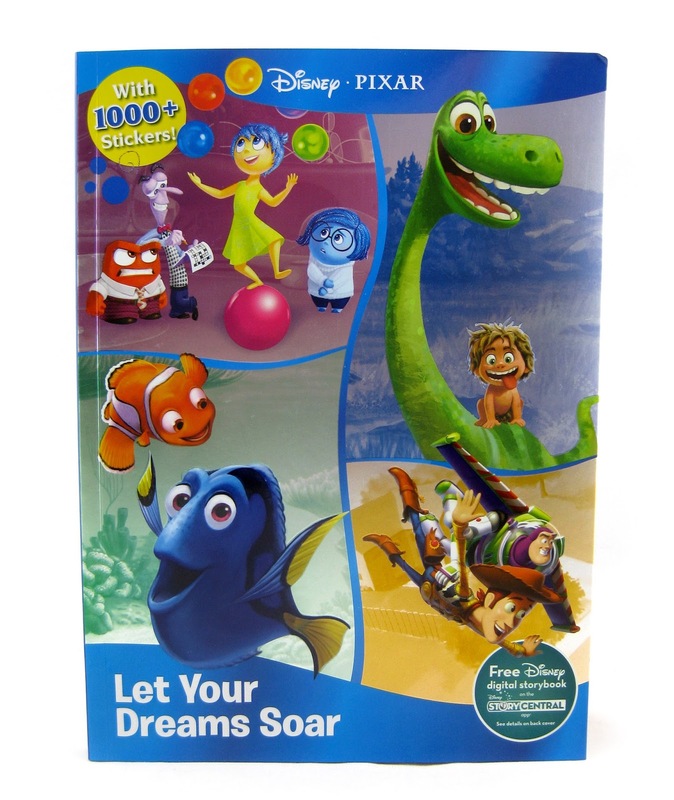 Kids will have a blast coloring all of their favorite Pixar adventures and then filling the pages with all the stickers! I'm very impressed with this release. It has a lot more in it than I thought! You can just tell it's very good quality all around. 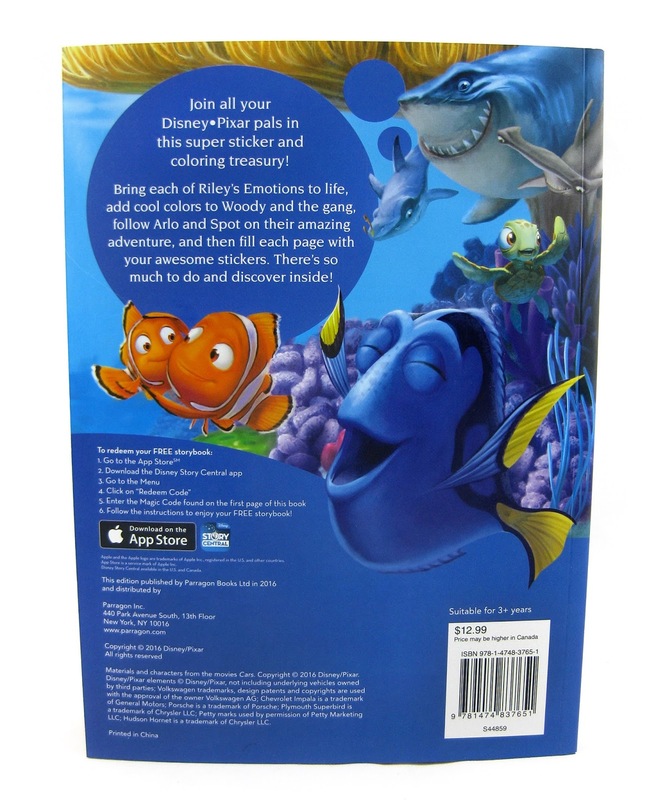 Though this is geared towards young kids (ages 4-8), the stickers can come in handy for anyone looking to deck out a letter/postcard, birthday card, birthday box/package, etc. 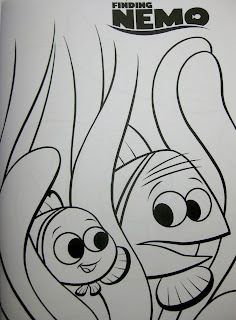 with Pixar characters. It's totally worth it just for all the fantastic stickers! 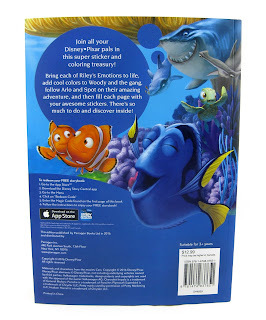 The book also comes with a free Disney digital storybook which you can redeem on the Disney Story Central app. I don't know exactly which book is included however, since I can't access the Disney Storybook app hardly at all (it keeps crashing- all the reviews also say it has this problem so I guess I'm not the only one having issues). As soon as I can redeem my code I'll update this post with the info! If you're interested in picking this book up, you can purchase it online HERE for $12.95. UPDATE- Now on Amazon as well. Thanks to blog reader HJ for the heads up!